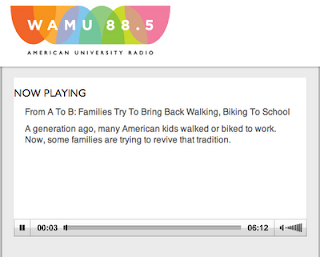 FABB member Jeff Anderson and his kids were featured on the WAMU radio show Metro Connection "From A To B: Families Try To Bring Back Walking, Biking To School." At about 1:45 into the program Jeff is interviewed. I like the quote from his daughter Laurel: "I like doing it because we're not using energy and it's a lot of fun and I like getting exercise in the morning." Jeff: "We're trying to get the school system to restart their bike and pedestrian education that they used to give. So we kind of have like 10 years with kids, from what I can tell, who haven't been given the pedestrian and bike education that they used to get." Christine Green of the Safe Routes to School National Partnership was also interviewed at about 4:25. She works to "bring all the players in the community together, that's the school system, transportation engineers, the planners, parents, the public health folks, community advocates" to help make it safer for kids to walk and bike to school.